Brainguru Technologies Wishes A Very Happy Republic Day ! | Brainguru Technologies Pvt Ltd. Welcome to Brainguru Technologies Blog, here you can find All content/articles about current Digital World. About Brainguru, We provide Top 10 Rank Solution With Search Engine Marketing (SEM), Social Media Optimization (SMO) Services in India. 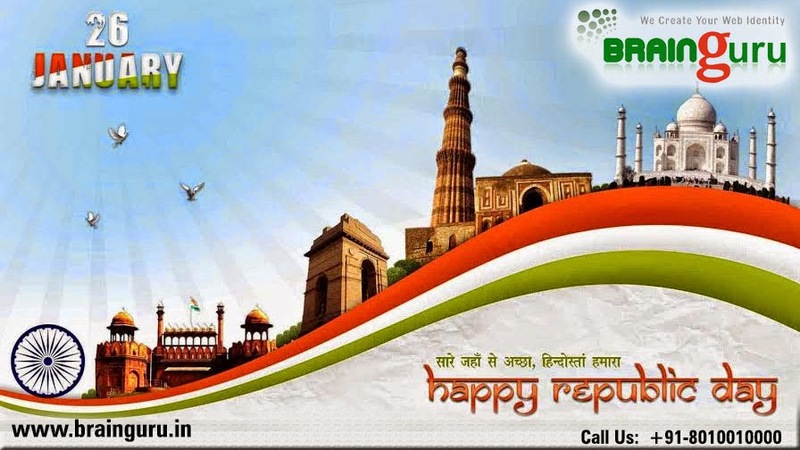 Home / Uncategories / Brainguru Technologies Wishes A Very Happy Republic Day ! Brainguru Technologies Wishes A Very Happy Republic Day ! We are proud to be an INDIAN ! Today, we celebrate our Republic Day, as it is the most important day in India, because on this very day we became a Republic and adopted our Indian Constitution. Today is a day of national strength and we should take the pledge that we will fight corruption, discrimination and terrorism to keep our country safe and clean. Republic Day fills each and every one of us with great emotions and make us feel proud and hold our head high. This day remind us of the India’s brave heroes, parading to the world its full might and grandeur. It makes us salute once again to Our National Heroes “Jai Hind”. They inspired us with the moving accounts of the BRAVERY & UNITY. Let's cherish and celebrate the Republic Day to honor the India's Constitution and the freedom fighters of our country, with a true feeling of patriotism for our Mother India. HAPPY REPUBLIC DAY TO ALL THE INDIANS ! Nice post . Thank for sharing . Internet Marketing Company, Search Engine Marketing Services India Internet Marketing Services or Online Advertising is the fastest growing medium adopted by businesses globally as one of the most effective web promotion tools. With years of experience in the Internet Marketing Services India and Web Promotion, Brainguru has accumulated essential expertise to successfully market businesses online and generate effective Return on Investments (ROI). SEO/SEM PPC Management SMM/SMO Link Building Seo Content Writing Social Media Marketing (SMM) Services, SMO Services Company India Social Media Marketing or Optimization is considered one of the most improved and influential methodologies for your website optimizing and marketing implementing the social media platforms. This is the handiest way to help your website get to the direct customers and attains popularity essential for building brand image and marketing. Brainguru Technologies. Powered by Blogger. Copyright © 2015 Brainguru Technologies Pvt Ltd.